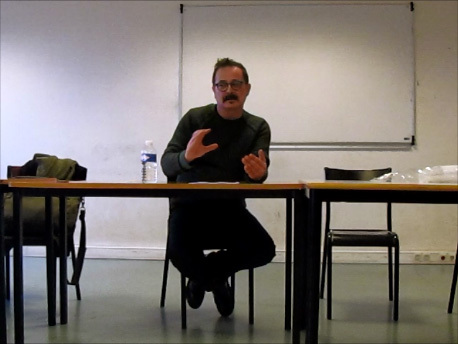 Dr. Zafer Aracagök (Istanbul Bilgi University) gave a seminar, Deleuze/Desonance, at Département de Philosophie, Université Paris Ouest, Nanterre La Défense on January 26, 2013. If philosophy is supposed to deviate the thought from the rule of the specular, as once was attempted by the Situationists, concept of ‘resonance’ in Deleuze and Guattari is perhaps already offering a non-relational relationship between various pairs or binaries which, especially in recent history and in the history of philosophy, have fettered thought to a sedentary regression under the rule of ‘real-politics’. Problematizing the maintenance of the specular as such, in this seminar, I aim to raise the question whether there is something else which puts the Deleuzian concept of resonance into resonance? I discuss that informing Deleuze’s reading of Duns Scotus, Leibniz, Schopenhauer, Nietzsche, Lacan, and quantum theory, this question leads to a question of the ‘first’ and thus creates various problems for Deleuze’s theorisation of the paradoxical entity, noise, voice and distance. Responding to this difficulty, I ‘point to’a concept, ‘desonance’ as a way of overwriting it with a problematisation I call ‘mimesis without specularisation’ or ‘specularisation without mimesis’ all with the intention of opening up new paths towards deterritorialisations particularly under the light of a nomadic concept of ‘resonance’ on a plane of continuous flight. Zafer Aracagök is an academic/musician who teaches art theory and continental philosophy at Bilgi University, Istanbul, Turkey. He is the author of three books (in Turkish) and a number of articles addressing the issues of image, resonance and noise in continental philosophy and in the philosophy of Deleuze and Guattari in journals such as Revue Chimères, Parallax, Pli-The Warwick Journal of Philosophy, Third Text, Rhizomes, Postmodern Culture and Symploke. His book, Desonance: Desonating (with) Deleuze was published by VDM Verlag, 2009. His musical work is well received, released and performed both in Turkey and abroad such as, UK, France and Italy. Aracagök organized ‘Resonances: A Deleuze and Guattari Conference on Philosophy, Arts and Politics’ at Bilgi University, Turkey in July 2010. He edited Resonances: Deleuze and Guattari special issue for Parallax (Routledge) published in January 2012.